Lara Croft has some unfinished business with the forces of Trinity. Her mission takes her into the Amazon jungle, where a hidden city sits and dozens of tombs are waiting to be explored. It's her most dangerous journey yet, as the Trinity saga comes to a close with Shadow of the Tomb Raider. With Shadow of the Tomb Raider hitting store shelves today, it's a good time to revisit our Shacknews review. It's also a good time to put it side-by-side with reviews from across the gaming world. In addition to the major outlets, we're also going to get opinions from publications dedicated to each individual platform, so that PC owners, Xbox One owners, and PlayStation 4 owners can all have their voices heard. Take these opinions and make your own choice. Shacknews 7/10: "In many ways, Shadow of the Tomb Raider feels like a strong conclusion to the 2013 Tomb Raider trilogy. It builds on all of the mechanics introduced in Rise of the Tomb Raider, adding traversal mechanics, adding combat tools, retaining many of the ideas introduced in the last game (such as items gated by language proficiency), and utilizing some of the best level design the series has had to offer. It really can't be understated how much additions like rappeling has added to the formula. "Square Enix, Eidos Montreal, and Crystal Dynamics have also pieced together one of the biggest playgrounds for Tomb Raider players to enjoy. It also embraces the idea that raiding tombs is what makes the series truly great, setting aside the superfluous modes of past games and simply giving players both a massive world to explore and numerous Challenge Tombs to tackle. It's an impressive feat, especially when one simply climbs up to a high, elevated peak and looks down at the luscious Amazon landscape, flowing waterfalls, and treacherous wildlife below. "As a final blowoff to the Trinity saga, I couldn't help but walk away feeling that the resolution to the story and to Lara Croft's character could have been so much better. But in terms of a pure "Tomb Raider" game, Shadow of the Tomb Raider is everything a bold explorer could ask for, giving players a vast jungle to explore and daring them to master it." Game Informer 7.5/10: "The whole adventure culminates in an ending that also isn't quite up to snuff. While Lara certainly shows growth through this journey and some closure is provided, it's all a bit of a letdown. I immediately thought, 'This is her defining moment? Her evolution into the Tomb Raider?' After following this origin story for three games, I hoped for a more rewarding finale. "Lara Croft often throws herself headfirst into the action without seeing the bigger picture. 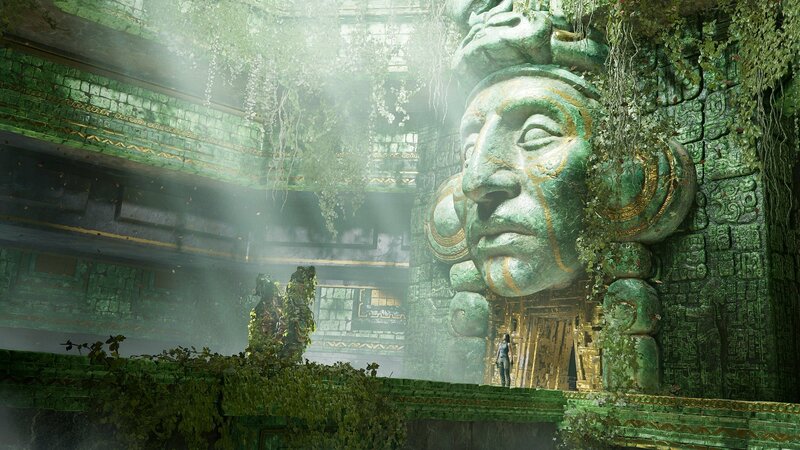 In a way, that's a good a parallel for Shadow of the Tomb Raider. Parts feel rushed with odd scene jumps and some of the gameplay systems feel half-baked. The game has its standout moments, but it's also full of unrealized potential. Whether it was a more engaging skill system or a bigger map, I was often left wanting something a bit more — yet, I could play it for hours. As the final game in Lara Croft's origin story, it just didn't hit the high note it needed to. Still, that doesn't mean it's not a crazy, high-stakes adventure worth taking." IGN 9/10: "A bigger world, higher stakes, and an unexpected spin on Lara Croft's character make Shadow of the Tomb Raider the most ambitious of the modern trilogy. There’s a lot going on here, but it manages to keep most of its balls in the air throughout its 25-odd-hour running time. As both a rollicking, horror-kissed action-adventure and an introspective story about obsession and family, Shadow of the Tomb Raider works as a powerful finale to this particular chapter of Lara's history. "Shadow of the Tomb Raider tells a great story that continues the series' tradition of high-concept, Indiana Jones-style mumbo jumbo. This time it's centered around an impending apocalypse and the search for the ancient item that can prevent it that propels Lara through the dark guts of South America. Moments of big, blockbuster-style scripted action return; skin-of-your-teeth action sequences that hurtle Lara across crumbling earth and bullet-peppered buildings, and feel like wonderfully orchestrated roller-coaster rides. It's a ton of fun." Destructoid 7.5/10: "Shadow of the Tomb Raider leans into what it does well (platforming, setpieces, and puzzle-based tombs) and shies away from its inadequacies (there are significantly fewer combat sections than in the other Tomb Raiders). Frequently, the camera wrests control away to perfectly frame a thrilling shot. For three installments now, these games have seemed as if they're seeking Hollywood's approval in a way. That's okay. All of this together is a potent formula that makes this feel like the most polished Tomb Raider yet. Shadow of the Tomb Raider knows what it wants to be." 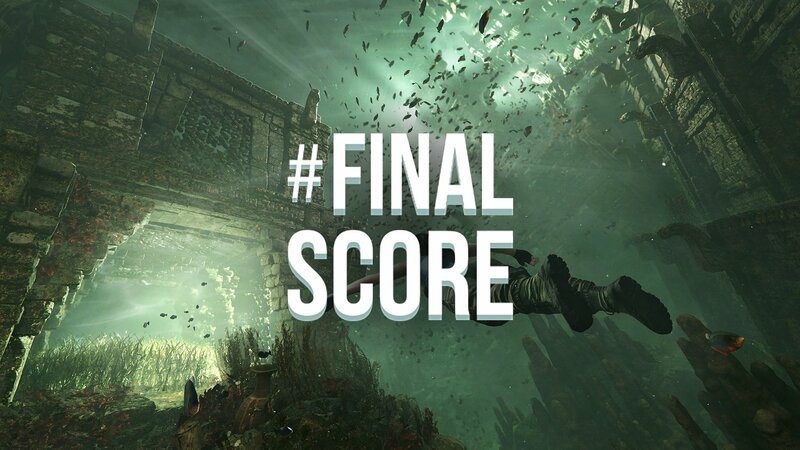 Xbox Achievements 80/100: "While the minute-to-minute gameplay itself and smattering of engaging puzzles is uniformly excellent, Shadow of the Tomb Raider doesn't quite make the most of its killer premise. While the central narrative is perfectly fine, many of the side-quests that surround it unfortunately fail to measure up. Challenge Tombs and crypts are great, while traversal and exploration of Shadow's lush environments is never anything less than a joy, and even the extended stretches in which you're swimming through networks of submerged catacombs can be tense as you evade piranhas and eels, desperately searching for the next pocket of air." PlayStation Universe 8.5/10: "Elsewhere, Shadow of the Tomb Raider is an undeniably beautiful game, with gorgeously realised locations, expansive areas and highly detailed character work – though PS4 Pro owners might notice something amiss. Whereas Rise of the Tomb Raider permitted users to choose between 4K resolution, 1080p resolution with enhanced effects or 1080p with improved framerate, Shadow of the Tomb Raider bafflingly strips out that middle option – and we’re not entirely sure why. In the end then, though the changes that the developer have wrought here are largely beneficial, there is still an inescapable feeling that Shadow of the Tomb Raider feels like more of the same game that we played almost two years ago, rather than a fresh, from the ground up attempt at expanding the franchise beyond its familiar boundaries." PC Gamer 84/100: "The balance of puzzling, exploration, and action has always felt a little off to me in this modern incarnation of Tomb Raider, leaning a little too heavily and frequently towards the latter. But Shadow shows impressive restraint, rarely using combat as a crutch and focusing more on what makes this series special: namely, raiding tombs. And the tombs here are undoubtedly the star of the show, and some of the best in the series. The feeling of trespassing in an ancient, cursed place is palpable, and hearing the stone door scrape open when you finally solve that puzzle is always a satisfying feeling. And it’s these moments, not the exploding refineries, helicopter battles, or expensive cinematic set-pieces, that make this worth playing." The Verge: "Shadow of the Tomb Raider doesn’t do much to tarnish the franchise, but it doesn’t do anything to advance it, either. It’s a competent game that amounts to less than the sum of its parts. And while an explosive final act delivers a welcome ramp-up in intensity, by the end, I was happy to be done with the story and this incarnation of the franchise." Shadow of the Tomb Raider is available now on PC, Xbox One, and PlayStation 4. That's too bad the reviews are average. Still stoked to play it tonight! From what I've gathered, most reviews are in the 8s and 9s, with a few 7s spattered about. Looks pretty solid to me. All of that and it's automatically an 8 out of 10 for me. 9 if they have a decent story this time (sigh). They have better gameplay all around than the Uncharted games, but I love the Uncharted games more, and that's because I love those characters and the stories they weave. By the 3rd Tomb Raider game I should start to care about Jonah and some of the side characters and the story but it's always a bit of a mess.